A great trick for kid shows, especially at Halloween. Two kids take an equal turn at removing apples from a bowl. Yet one child ends up with 5 apples and the other 2 apples. Baffling to an audience. Magician directs from a distance. These are some of the most unusual effects ever developed for a stand-up performer. Effects your audiences haven't seen before. These routines are based on an ancient close-up effect that has been revised so it can be seen on the largest stage or in someone's living room. You can work this under any conditions with no angle problems or special props. Routines for both adults and children. Three effects are explained in this release. All are proven stunners from Devin Knight's shows. Apple Heist: A man and a woman are told to pretend they are going to make an apple pie. Each is given an ungimmicked paper grocery bag, and each takes turns removing one apple at a time from a clear apple bowl, placing the apples into their bags. This is done until the bowl is empty. Somehow, the man ends up with only TWO apples, not enough to make an apple pie. Amazingly, the woman ends up with FIVE apples, more than enough to make an apple pie, even though they took equal turns! For a stunning climax, the performer shows a prediction (that has been in full view) that he made before the effect began predicting the final outcome, even calling the lady by name. A one-man effect with no stooges that comes complete with proven comedy patter. This one will leave your audiences stunned as to how such a thing is possible. No skill and easy to do. The Magic Candy Game: A great trick for birthday parties. The birthday child and another child take equal turns removing different candy bars from a bowl (no two candy bars are the same, which adds to the mystery). The child with the most candy bars wins the game. When one child looks in his bag he has only TWO candy bars, while the birthday child has FIVE candy bars. What kind of trickery is this? Trick or Treat: One of the best tricks ever developed for Halloween shows. What better than do a trick with candy? Two children are given trick or treat bags and take equal turns removing different candy bars from a Halloween candy bowl until the bowl is empty. The performer tells a story about two children who went to a magician's house and said, "Trick or Treat." The magician says, "Ok, I will show you a TRICK, using your treats without touching them!" The magician waved his hands, when the children empty their bags; one child only has 2 candy bars, while the other child now has 5 candy bars. Baffling beyond words. Magician directs from a distance. This is Devin Knight's brilliant elaboration and original adaptation of an old coin trick into a hilarious and entertaining attempt by a couple from the audience to work together to make an apple pie, and in addition, Devin has also created two ingenious children's magic show tricks that work in a similar way with candy bars instead of apples. 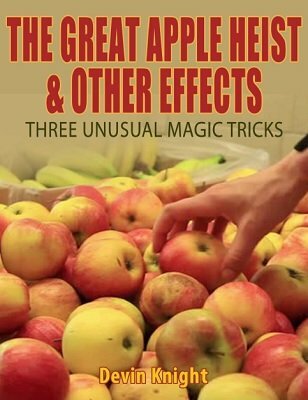 What makes these three tricks different from many other effects is that they do not revolve around a central magical appearance or disappearance, and each of the three effects have suspense, excitement, and offer an entertaining good time.